Nirka Reyes is a powerhouse. 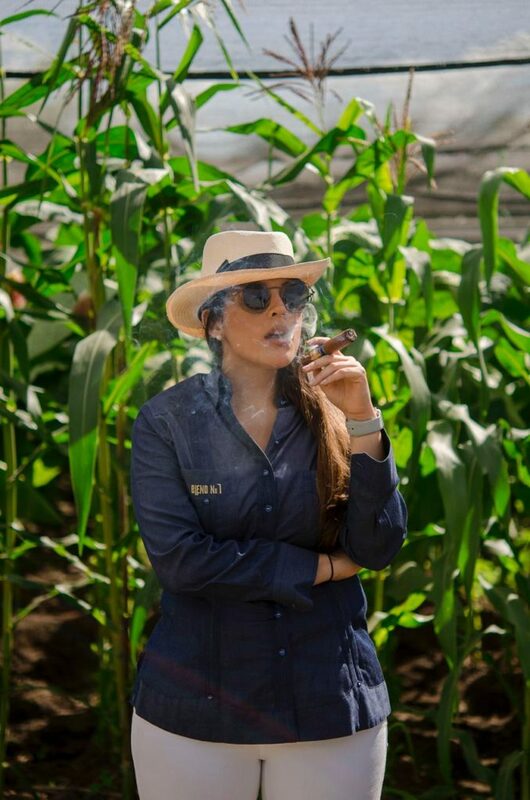 She’s the president of De Los Reyes Cigars, manages the factory, and is the face of the company. After talking to her about her schedule, we haven’t quite figured out when she sleeps. 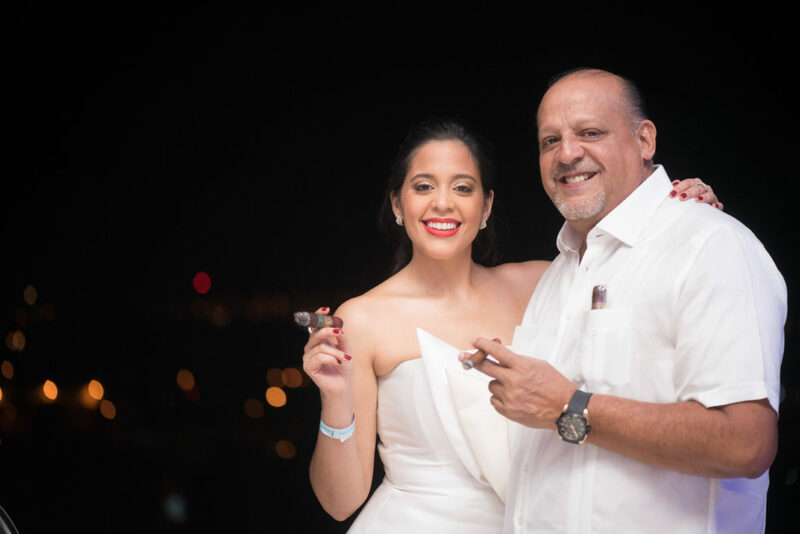 Attend any cigar party, event, or festival and you’ll likely find Reyes smoking a SAGA cigar and deep in conversation. She has an uncanny ability to make whomever she’s talking to feel like the only person in the room. She’s also intensely smart and one of the most genuine and kind people you’ll ever meet. We sat down with Reyes in Las Vegas last summer to ask her what she eats for breakfast, what she is currently reading (she’s been a bookworm since she was four), and about how she is an inspiration to women in the industry. Cigars & Leisure: Let’s start with something silly: What do you eat for breakfast? Nirka Reyes: Usually I eat oatmeal packings that I make myself. I’m big on that. Blueberries, some dark chocolate, a little bit of chia. That’s what I like; it makes me feel good all day. Walk us through what happens when you get to the office. When I get to my office, I have this beautiful lady called Josefina, we call her Fina, who brings me coffee. She makes the best coffee in the world and will bring me a cup every morning. Then I have my first cigar. 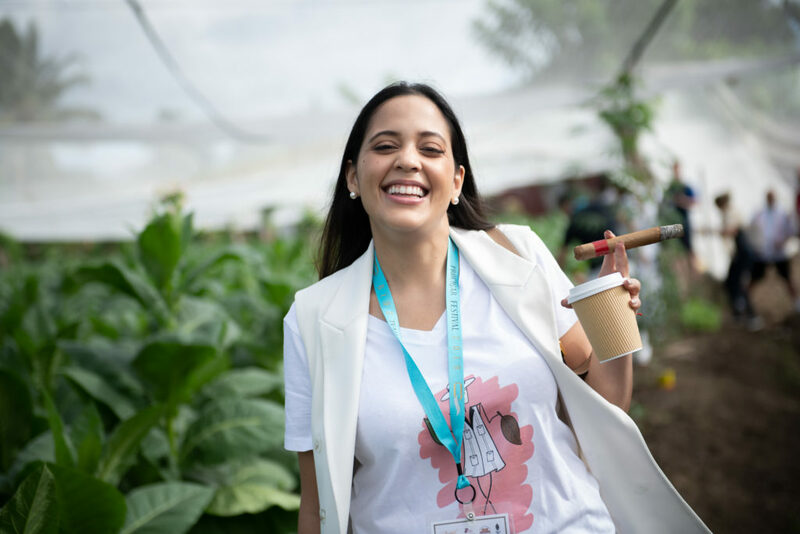 It’s a tradition that I learned from my father, and he told me, “When you start your day, you should start it right.” You smoke a cigar, drink a cup of coffee, and you meditate on what you want to do with the day, meditate on your blessings. And that’s what I do. It works; it allows me to ease into my day and come at it with a positive mind, and then it doesn’t matter what happens during the day. I’ll have the right attitude. What’s your first smoke of the day? And I know you smoke throughout the day, correct? I do, I do. In that way, I don’t have something consistent. Some people have their morning cigar; I don’t have that. I actually savor cigars more than I do food, and since I know my blends by heart, I just say, I want this one today, and that’s what I’ll smoke. I have a humidor right there in my office full of cigars, and I just pick one. Good planning [laughs]. I try to feed everything in my life. I don’t want to be the person who, even though my big passion is cigars, devotes myself completely to that. 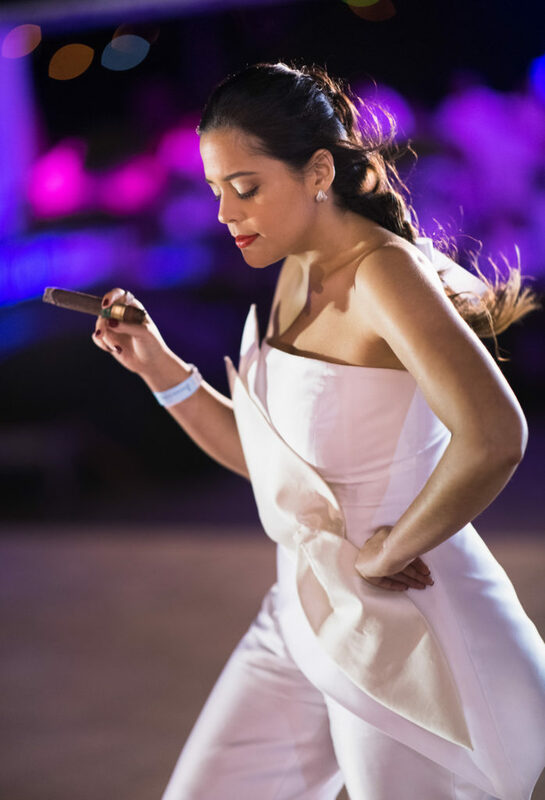 I’m the kind of person who wants to take time to work out and be with my family, and that gives me the energy to accomplish everything I need to do: all my traveling, my two jobs, managing the factory, being the “image” around our cigars—because in this industry you need someone who people can relate to in the brand. It’s wonderful, though, because when you love what you do and you’re passionate about it, it doesn’t feel like you’re working. Even the hardships that come and everything that’s happening in the industry that people are concerned about—we’re going to attack it. In my company, we’re not a team; we’re a family. Most of our employees have been working for 20 years for us. It’s a beautiful environment, and that’s my support, so giving them a better life, that’s my goal. If my focus was, “I just want to make the No. 1 cigar in the world,” or, “I just want to be the most famous manufacturer in the world,” that’s so vain. That’s going to go away at some point. But giving the people who have been supporting us from the beginning a better lifestyle? That’s my goal. When was the first time you smoked? When did your dad first give you a cigar? [Laughs] He never gave me a cigar. 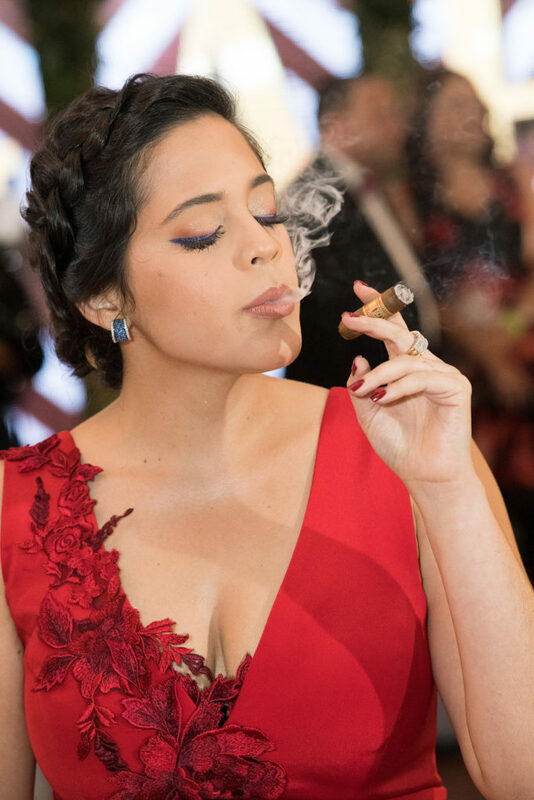 The first cigar I had was a small handmade cigar my dad used to do for the Spanish market, and he just left them out one time, and I was with a friend—I was 16 at the time—and we tried it and completely hated it. I hated it. But I had always loved the way that it smelled and still did. After that, I was studying in Switzerland and one of our family friends gave me a cigar to smoke when I was 18, and it was actually one of my dad’s cigars. And I thought, “Hmm, this is all right.” When I came back from Switzerland, my father had this tradition of smoking cigars with my two brothers, and I started joining in. I loved it then. So I put my application in right away and started working at the factory. And those were the first cigars that I can actually say I enjoyed. Before, when I was in Switzerland smoking, I didn’t quite understand it, but then when I sat down with my father and he explained to me everything about the cigars, I really began to appreciate it. “Oh, I like it,” I would say. Then he explained to me how different leaves have an impact on the palate and how it stimulates the palate, and then I fell in love. How do you like to relax aside from smoking a cigar? I like to go away for the weekends. But when I’m in the Dominican Republic, I like to take time to sit down, get a good whiskey or scotch, and read and smoke a cigar. And that’s it. We have our home away from home in Puerto Plata where I can see the beach and the mountains, and we have this place there where my dad and I keep our whiskey collection, and it’s perfect for reading there with the beautiful view. That’s me: book, whiskey, and a cigar. What are you reading right now? And who is a favorite author? Oh god. Oh my god [laughs]. My favorite author … I think I don’t have one. I used to love Jane Austin, but right now I read pretty much anything that anyone recommends. My goal for this year is to finish all of Ernest Hemingway’s books just because of his relationship with cigars. I thought that was really interesting. Right now, I’m reading a book that I don’t even remember the author, but it’s about how do you become more creative in your life and how to use ideas in a better way. Because sometimes you have all these crazy ideas and you don’t know how to follow through. So I mix up my books; sometimes I want to read a novel just to relax and enjoy it and not think about it too much, but then I mix it up with a Harvard Business Review book because I like to keep updated on stuff like that. [Laughs] I am! I’ve been a bookworm since I was about four years old. The other Reyes guys were joking before that I read all these books but never know anything about TV shows. I have to choose one or the other. The other thing too is I have this huge commitment where I write every Wednesday for women something on social media that will help empower women. I’ve been given an extraordinary opportunity of being a woman in an industry that’s full of men. Just by normal, older practices, it would have been my older brother that would have gotten the factory. Instead, it was me. I think that women should understand that they have equal opportunities and to start grabbing them. So I read a lot of self-improvement books to help me get content to say on these posts. You are a huge inspiration, and role model, to not just women but men as well. What you’re doing is exceptional, and we all value what you’re doing. Oh my god, you’re going to make me blush. Thank you so much for saying that. One last question: In all your travels, what’s your favorite place that you’ve been to? There’s many. I have many favorite places. But I fell in love with Florence, Italy. I want to get married there. I felt such a peace there, and I was able to smoke cigars and enjoy them in a very different environment. Everywhere I go, I always find a place that I’m mesmerized by. Maybe it’s because I have such a positive outlook on life, and I feel so welcome everywhere I go. Because of that, parts of my heart have remained in every place that I go. 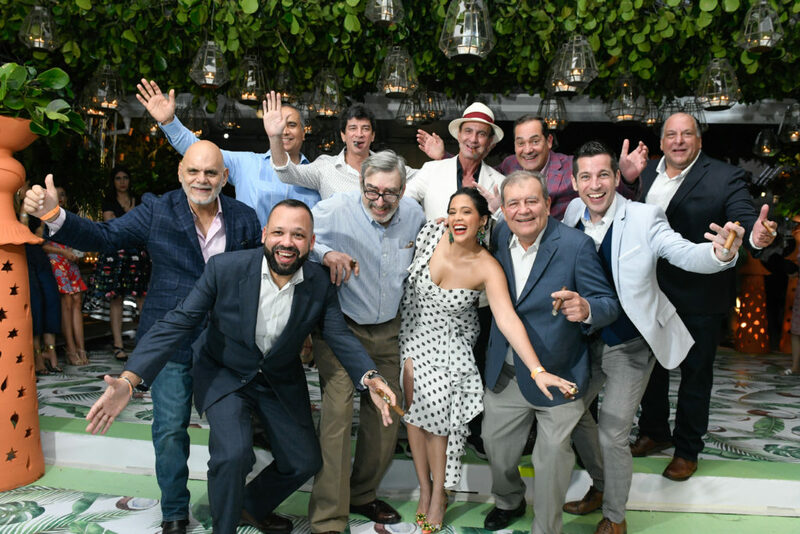 For more on De Los Reyes Cigars, visit reyescigars.com. 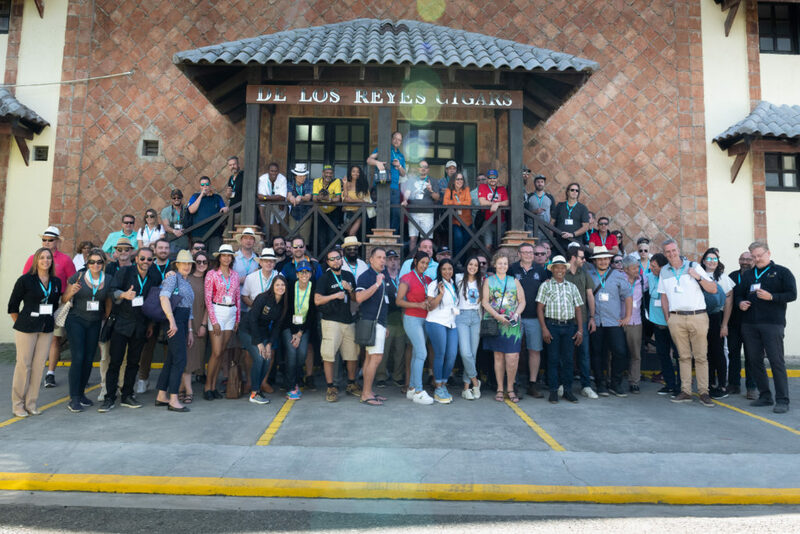 We had the wonderful opportunity to tour the De Los Reyes tobacco fields and factory during the Procigar Festival in the Dominican Republic. And who was our tour guide? Nirka Reyes herself. Their 20 acres of fields are set in the middle of a town called Navarette, and out of nowhere this tobacco oasis materializes. Greeting us as we exited the bus was an area called the Hangover Cure, where they had Pepto Bismol, Advil, water, and more. After partying the night before, it was much needed for many of us. Cigars were also offered, Patoro was the brand of choice for the morning, and coffee made from scratch. Nirka then took us into the fields and explained each process of tobacco growing (the wrapper is their specialty there) and answered numerous questions. My favorite fact that I learned during this tour is that corn is planted around the tobacco to keep bugs away. Because of this, no pesticides are needed, making it a truly natural product. 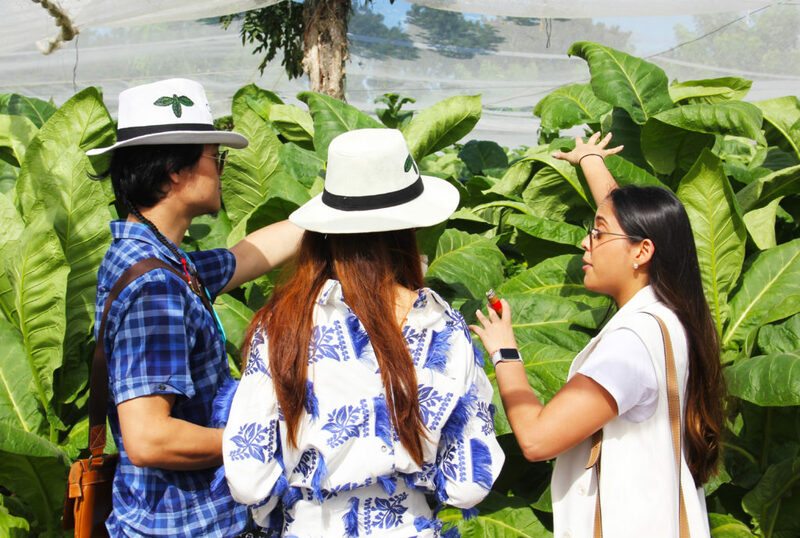 Nirka Reyes explains the tobacco growing process during the excellent tour of De Los Reyes Cigars. The tour includes a lunch stop at Saga Restaurant & Cigar Club, which is owned by the Reyes family. This restaurant features delectable food and a wonderful backroom where smoking is encouraged. After stuffing our faces, we went over to their factory to see how Saga, Debonaire, and Indian Motorcycle cigars, among many others, are made. Of the numerous tours I’ve done, this one was the most hands-on and fun. 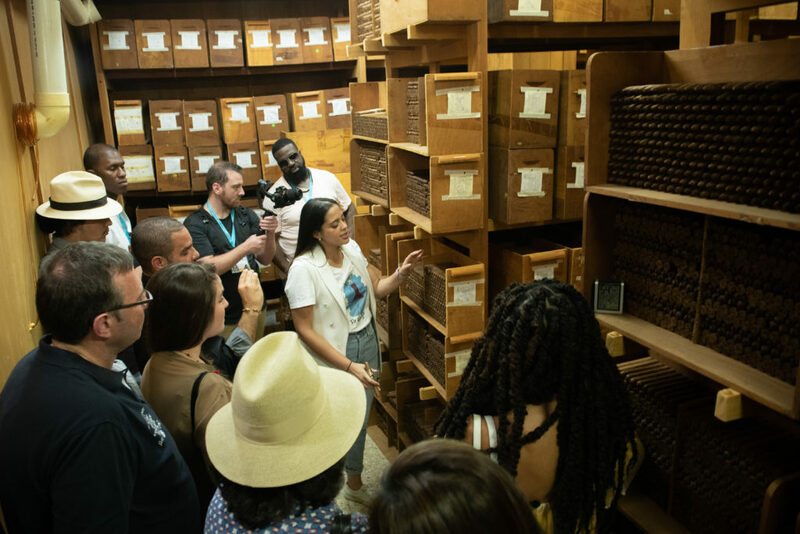 They had us try our hands (and eyes) at sorting cigars by color, which proved to be way harder than one may think. They also allowed us to roll our own cigars under the watchful eyes and assistance from master rollers. This tour of both the fields and factory are not to be missed (and don’t forget to eat at Saga). And if you get the privilege of having Nirka lead your tour, well then, you’re experiencing something truly special.